It was Friday evening and after lazing till 9 Gopi tells me we have to go to the casino in an hour. We needed to eat and I needed to cook something real fast. I rumaged in the fridge and found some (leftovers) califlower and capsicum staring right into my face. I would be throwing them anyway if I would not use them today and so I quickly made a crispy capsicum and cauliflower crunchy veggie which went very well with some hot chapatis. 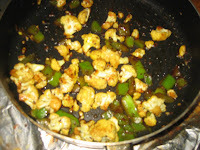 In a kadai, heat some oil , once hot add some cumin seeds, add the cut cauliflower and capsicum, sprinkle some salt, pepper, some soya sauce and let it cook for a few minutes. That's it-- your dish is ready. I am sending this Crispy Capsicum Cauliflower dish to the Receipe for the Rest of Us- Dinner Theme. ALso linking to the One Page CookBook"
thats a really quick dish Seema. Thanks for sending along.